As you establish your first home bar, you'll need to put together a few must items in order to mix the perfect cocktails. As you develop your bar, you can add champagne flutes and then develop your glassware artillery to include red wine glasses, white wine, stemless--tumbler-style glasses. HOW MUCH LIQUOR PER PERSON? DECANTER BANTER: Try using a decanter to decorate your home bar--especially if the original bottle is unattractive or can easily be identified as cheap. The Ancient Romans used glass to make their decanters. After the fall of the Roman Empire, glass decanters faded out in favor of bronze, pweter or pottery-type vessels. Glass was brought back by the Venetians during the Renaissance and designed a long slender neck that opens to a wide body increasing the exposed surface are of the wine allowing it to react with air. British glass makers introduced the stopper in 1730 to limit exposure to air. 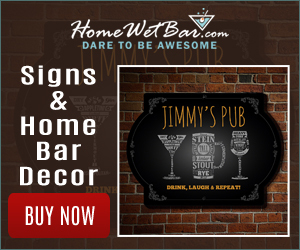 This list will help you get Your Home Bar stocked and fully operational! VERMOUTH: Red Vermouth is for Manhattans and White Vermouth is for martinis--gin or vodka. Vermouth is a wine and cannot be stored for more than 30 days in a cabinet, but can last 60 days in the fridge. Consider adding Cointreau and Bitters as you expand your recipe offerings.